The Oilers take on the San Jose Sharks on Friday. Game time is 8:00 p.m. MST and it can be seen on TSN. EDMONTON, AB - A close game, dominated by goaltending and penalty killing ended in two empty net goals by Dallas, resulting in a 3-0 Edmonton Oilers loss to the Stars tonight. It is the first time in franchise history that the Oilers have been shutout in three straight home games. "It's extremely frustrating not to put some in the back of the net," said Oilers Captain Andrew Ference. "It's one of those games again where you can point to positives but at the end of the day, you don't get the job done and don't score and you lose the tight ones." Jordan Eberle was robbed by Kari Lehtonen in the first period when the Dallas Stars goalie flashed the glove in highlight reel style to deny an Oilers score. Lehtonen would finish the game with 22 saves in the shutout win. "Well, you need to score to win games," said Oilers Head Coach Dallas Eakins. "I thought early we had chances, some great chances that could have been easily converted. We didn't, obviously, convert on them." Rich Peverley carried the puck down the left wing and eventually roofed his own rebound in close on Oilers goaltender Devan Dubnyk, at 10:35 of the second period to end the scoreless outing. The Oilers successfully killed off a 5-on-3 Dallas man advantage in the third period, allowing just two shots on that power play, to keep the score 1-0. The Stars finished 0 for 6 on the power play. On the opposite side of the ice, the Oilers failed to convert on their own five power play attempts. 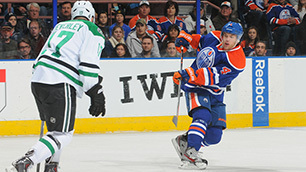 "The first unit moved the puck pretty well but I think we're missing the shots," said Oilers forward Ales Hemsky. "We don't score the dirty goals around the net like other teams do. That's one thing we have to get better at." "You don't want your units scoring nice goals all of the time," said Eakins. "You need the ones that are bombed rebounds. I thought there were rebounds there tonight and it was just a night where we couldn't get our sticks on it. It wasn't a night where I thought our power plays were bad." Dubnyk stood tall with 3:04 remaining in the game as he denied Valeri Nichushkin's penalty shot. Dubnyk's 23 save night was spoiled as the Stars escaped with the narrow victory. Tyler Seguin and Antoine Roussel both scored empty netters at the end of the third period to spur the Stars to victory. "It's a huge challenge for everybody to keep their heads up and not grip the sticks too tight because we did generate some chances, we got to bury them," said Ference. Tonight's game also marked the return of former Oilers Captain Shawn Horcoff, who was traded to Dallas in the off-season. "I was nervous in the first period," said the Dallas forward. "I think once it got closer to the game, I got a little bit emotional. The (video) tribute was real nice. I thought the respect from the fans was great. I'm just happy it's over with and we got the win."